MERCH MADNESS: These cult-fave characters make for a mighty slate of action figures. 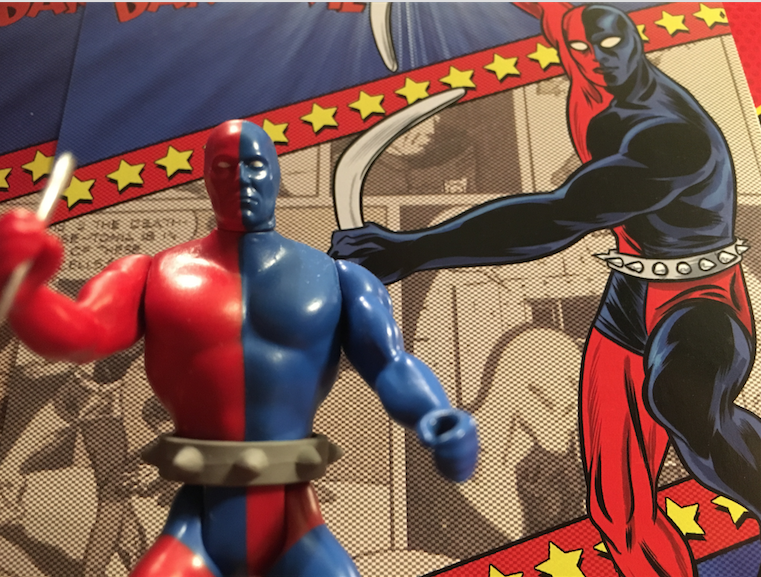 Over the next three weeks, we’re highlighting some of the coolest action figures and comics swag on the market for … MERCH MADNESS. Click here for more on that awesomeness. 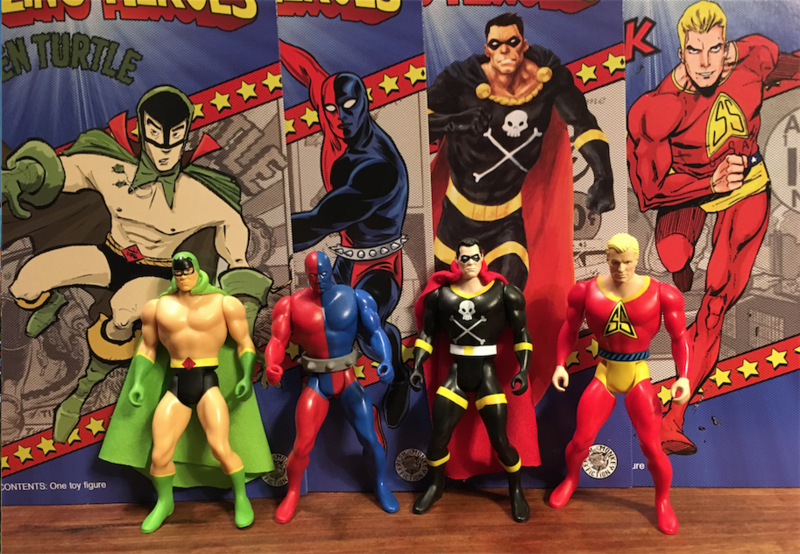 For someone who’s never read a Black Terror or (original) Daredevil comic book, I’ve been inordinately excited for Fresh Monkey Fiction’s Kickstarter-generated action-figure line, Amazing Heroes. It’s all about the look and the aesthetic of the figures themselves. 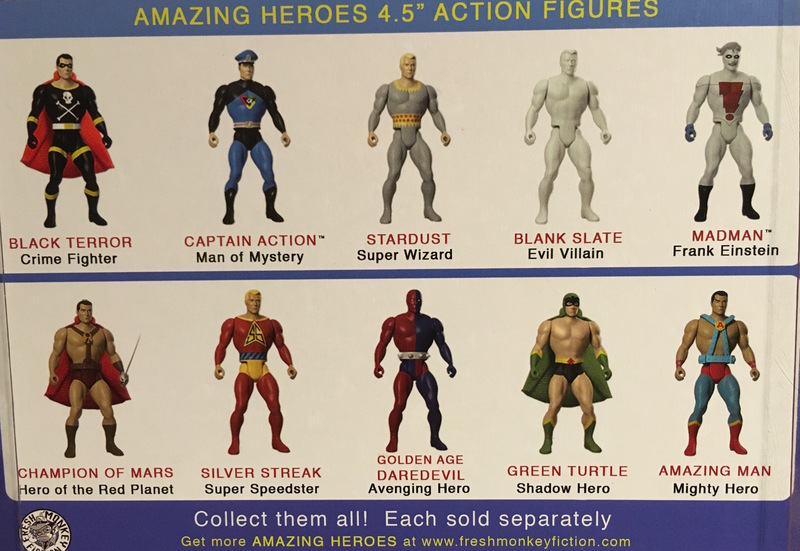 There are 10 of these 4.5-inch, Secret Wars-inspired figures in the first wave, including seven public-domain heroes from the ’40s who’ve popped up now and again in the intervening decades: Black Terror, Daredevil, Silver Streak, Green Turtle, Stardust, Amazing Man and Champion of Mars. 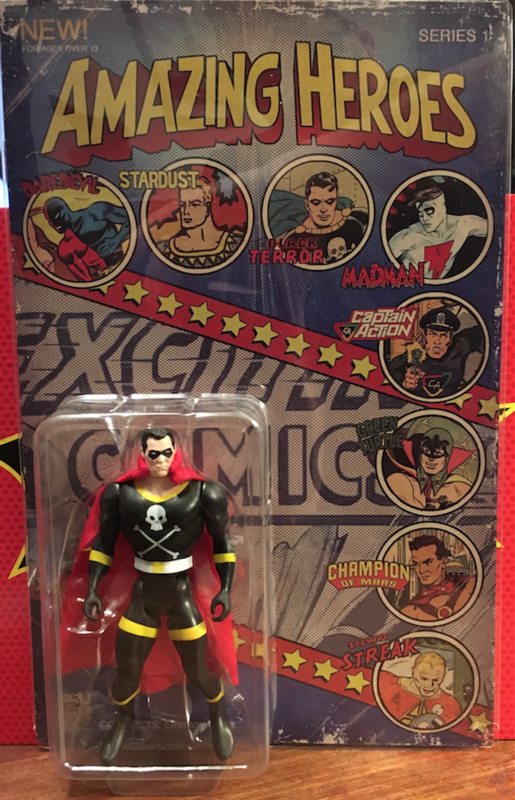 There’s also Mike Allred’s Madman and Captain Action. Rounding out the set is Blank Slate, an all-white figure that’s nominally a villain but really just fodder for customizers. 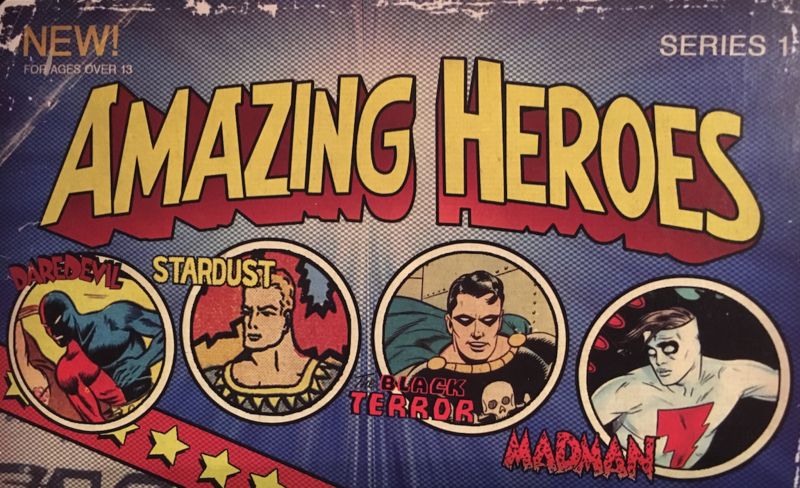 Green Turtle, Daredevil, Black Terror, Silver Streak, with artwork by (respectively) Sonny Liew, Mike Allred, Tom Fowler and Tim Seeley. Over the next few weeks, as part of MERCH MADNESS (click here for more on that) I’ll be focusing on a few of these guys at a time. And I’m starting with my two favorites: Black Terror and Daredevil. 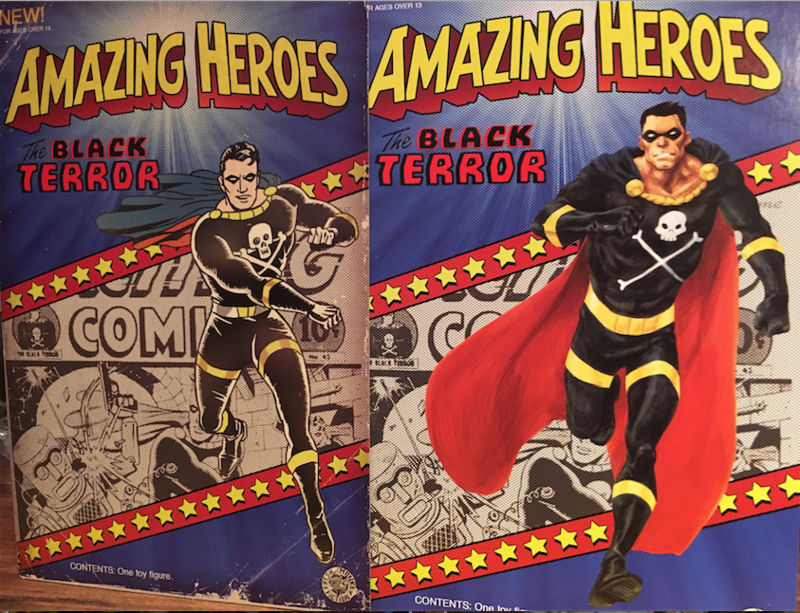 I first encountered both of these guys on the cover of Steranko’s History of Comics (which I wrote about here) and I know virtually nothing else about them other than they’ve been revived by Dynamite in recent years. But so what? The character-specific card backs have brief bios and it’s not hard to track down examples of their original stories online. In fact, I found out that Daredevil actually lived in a mansion in New Rochelle, N.Y., which is not far from 13th Dimension’s secret lair. This is really about design. 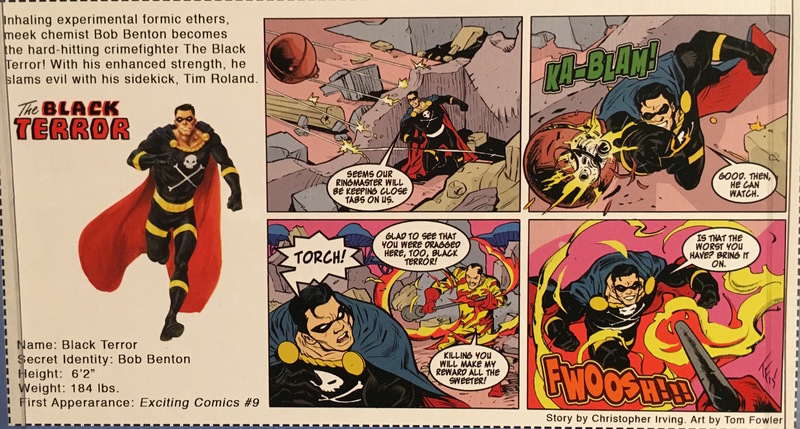 When I first saw Black Terror all those years ago, I thought he was a bad guy, because why wouldn’t you? I mean, he was one badass-looking costumed tough guy and it just goes to show you that even a great outfit wasn’t enough to keep a hero afloat at the twilight of the Golden Age. 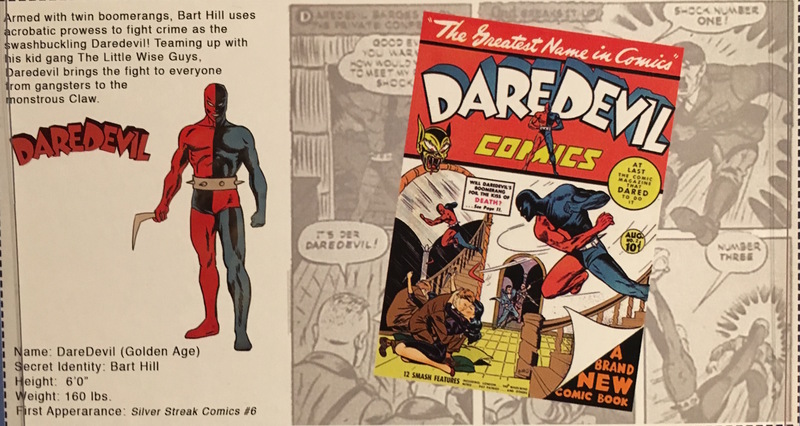 As far as the card backs, the Artist’s Editions feature Black Terror by Tom Fowler and Daredevil is by Allred. Excellent pairings in each case. For the complete MERCH MADNESS INDEX of cool swag reviews, click here.